About: Chalet Restaurant serve a variety Continental dishes at their restaurant and seating on the pavement area is provided, weather permitting. 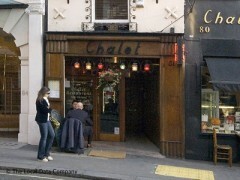 Been using the Chalet since 1965....gangs of us sometimes as many as thirty consisting of Chappell staff in New Bond St, the recording studio and anyone using same from Labi Siffre to Tom Jones the Stones the WHO all the girls from Lucy Clayton grooming school and so forth....wonderful...always. The tragedy is it closed a little while ago. We heard that the owners intended to restart further up the road. Wish we could find out if and when and where. My husband and I attempted to go here for lunch today. When we walked in, I had a takeaway cup of tea from Starbucks, and the owner (I presume) immediately said, "You have cups, you cannot have a table." She was unnecessarily rude. We would have happily left to finish them outside, (my husband had a tiny cup that was a sample shot of coffee, not even a real drink), but my husband was cutoff as he started to say this, and we were again told to leave. The woman was caustic, and then said that she had "plenty of business." Will never go here again, and would urge others not to as well. I was there today with my family,we had a delicious lunch,my wife loved the food and the service,big thank you to the romanian girl. The Breakfasts here are amazing - proper quality sausgaes and bacon all beautifully cooked. Yum. My daughter loves the spaghetti bolognaise and I think the full breakfast is fantastic.